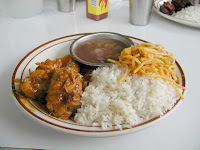 MIMI'S RECIPES: Dominican style chicken "Pollo guisado"
Season the chicken with pepper, salt, Goya or Maggi seasoning, and oregano. Add onion and sliced and de-seeded aji. Marinate for one hour. In a pot, heat the oil and once it is very hot, throw in a pinch of sugar to help brown the chicken. Add the chicken to the pot. Brown the chicken on both sides for a few minutes on each side. Add spoons of water regularly to keep the meat from burning. Add some more water and tomato paste. As soon as the meat is tender, reduce the water. Add the rest of the ingredients (onion and aji) and fry. Add some more or reduce water so that the sauce has a nice consistency.